In mid 90’s, the food crisis in North Korea that began in the early 90s and the ensuing famine and the flood of 1995 caused millions to starve in an already weak state. We started nationwide fundraising campaign for humanitarian assistance along with JTS New York in 1997. Along with public campaigns, we also urged the government to provide large scale food and medical aid by running 1 million signatory campaign. 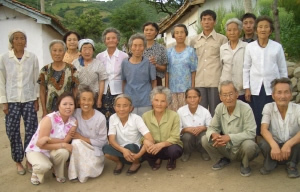 At the end of 1997, a nutritional food factory was set up in Rasun for the children of DPRK, feeding 11,000 children in 110 daycare centres. 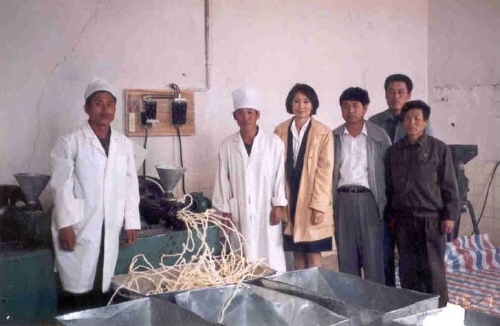 In 1998, in order to increase the food production capability of North Korea, agricultural supplies such as fertilizer and plastic sheeting were provided to Rasun, Chungjin and Onsung. In 2005, 300 tons of fertilizers and plastic sheeting was provided to Pyongyang region and 720 tons of fertilizer to Onsung district in Hamgyung province. The children born during the food crisis of the 90’s are entering the adolescent stages of their life but due to nutritional deficiency, and chronic food shortage, these children have the appearance of 6~7 year olds of South Korea and are exposed to various skin diseases. These children are future partners of our children. If these children are unhealthy, it will be difficult to guarantee happiness for our children in the future. Caring and nurturing these children is preparing for the future of our children and the unified Korea. 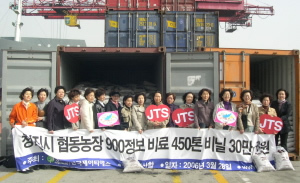 Since late 1997, JTS has been providing food supplements to the children of Rasun and in addition, food supplements and stationeries have been provided to 4000 children of Chungjin. First agricultural assistances started with fertilizer and plastic sheeting which helped to increase food productivity and the additional assistance with agricultural technology further increased the food production up to 9 times for some crops. Fertilizer assistance is not unconditional – we demand a portion of the increased production output to be re-distributed to the daycare centres and orphanages in North Korea. This principle will also be applied to the development projects. 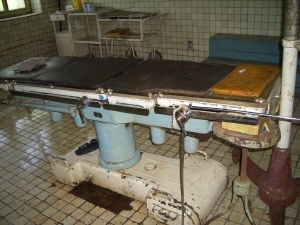 Starting in 1998, agricultural supplies were sent to Rasun, Chungjin and Onsung. Looking back at our work for the past 8 years assisting North Korea, we are coming to conclusion that in addition to emergency reliefs, assistance to North Korea shift its focus to long term development. Plans are being made for children’s food supplement, education materials for adolescents, phy-ed equipment, improvements to daycare facilities, improvements for clinics as well as medical supplies to improve the living conditions of the residents and development assistance such as fertilizer, plastic sheeting and farm equipment, road repairs, river embankment repair, re-organization of farm lands and reforestation to bring increase in food productivity. Providing assistance over a broad spectrum of development needs instead of focusing in on a narrow category we try to bring improvements to the lives of the residents. Such program need not require large scale funding and if managed properly, it will help the region to independently be self-sustaining. For instance, fertilizer will be given to farms and a portion of the increased output will be used for producing food supplement for children. Also, a portion can also be directed to mines to exchange for coal for heating daycare centres. This is how assistance can be used with multiple beneficiaries. In addition, boats and fuel can be provided and the catches can be sold to Korean markets and the profit used to cover the cost of the boat and the fuel with remaining for keep. Such model can be used for road, transportation, forestry, medical clinics, and education to use small capital input to expand into larger regions. If large capital investment is needed, it is difficult to expect voluntary participation of the people but using such loan method, we expect to stimulate the local economy. Such model needs to be successible in the most destitute district in order for it to expand to other regions. JTS will focus on one district in order to set a model for such case.